As Christmas approaches, people across the world are currently preparing for the festivities. For Christmas to truly be Christmas, there are certain traditions that cannot be missed or omitted for the biggest festive season in the year. Some of these traditions such as the Christmas tree tradition, decorations and more are the same everywhere. But, there are certain ones that are specific to each country or region around the world, and Nigerians also have their own special tradition that is unique to only Nigeria. Christmas this year would take place on Tuesday, December 25. Ahead of the celebrations, and we compiled a list of the Christmas traditions we have in Nigeria. Christmas trees and decorations are a must do for this time of the year. Many families would have started to hang up their decorations and stand their trees just to make their homes more Christmas friendly. In ancient times, the trees became tradition because trees were brought indoors and decorated to ensure good crop for the coming year. However, now it is a must do Christmas tradition. It is safe to say Nigerians cannot do without their jollof rice during festive seasons, and Christmas is no different. 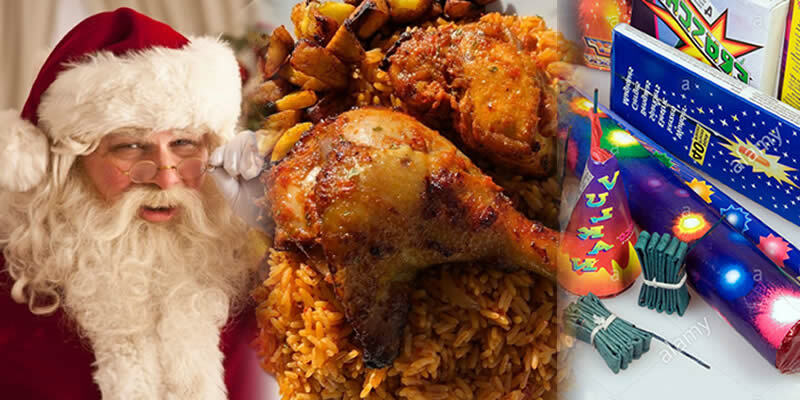 Almost every household cooks their special jollof rice and chicken to eat while celebrating the season with family. During the time leading to Christmas, some households start to stockup with fire crackers. This tradition is one that happens every December in Nigeria. From streets to streets the sound of fire crackers going off is one that comes with the season. In Nigeria, buying Christmas clothes for the family is seen as a form of Christmas gift. In most households, every member gets a new cloth to wear on Christmas Day. The tale of Santa Claus also known as Father Christmas is a myth that originated a longtime ago. The myth tells the story of a man in red and white garment held together with a black belt who gives gifts and goodie bags to kids that have been good all year. Now, as part of the tradition, every Christmas event has a Father Christmas that gives gifts to kids and even offices have the Secret Santa event in which colleagues gift each other secretly. Christmas carols are played during the days leading to the 25th to show that the Christmas spirit is in the air. Her are some Retro styles we compiled from the past . We wish you all Merry Chrismass in Advance.